AK prices show a huge variance — the price in Eastern Europe are more than twice as much as in Africa and the Middle East. Prices vary even more at the local level: in Beirut in May an AK in good condition started at $1,600, rising to $3,750 for a short-barreled variant — likely an AK-74U, an AK line carbine firing a smaller, intermediate-caliber cartridge designed in the mid-1970s to partially to replace the AK-47 and its modernized AKM successor in Soviet service. What explains this wide variance in small arms prices by region? Killicoat offers two interesting arguments. Like all consumer goods, small arms prices are fundamentally an expression of supply and demand. Supply varies widely by regions. Most obviously, the availability of AK line weapons is a given region is based on how widely Soviet weapons were exported in that region. During the Cold War, the Soviet Union supplied client states around the world with literally millions of AK, RPK and RPD line assault rifles and light machine guns. Millions more knockoff weapons were manufactured by unlicensed local producers. However, Soviet small arms exports varied widely by region: more weapons were supplied to client states in Africa or Asia in Latin America, mostly due to the fact that a much higher number of Soviet-aligned states were found in the Eastern Hemisphere. Millions more AK line weapons are circulating in Africa than in the America, lowering the local price. Of course, not all small arms are Soviet designs. However, Western arms exports paled in comparison to Soviet production during the Cold War (for example, over 100 million AK line weapons have been produced, compared to under 10 million American M-16 line rifles), and the world small arms trade remains dominated by Soviet designs. In regions where the Soviets exported more weapons, like Africa and the Middle East, we can expect supplies to be greater and retail prices lower. However, supply is not wholly determined by Cold War-era Soviet export practices. Government regulatory capacity is also a determinant of small arms supplies. Regional AK prices appear to support this theory — prices tend to be lower in regions that display lower average levels of government capacity, and higher in regions that tend towards more stable governments. Because African governments are typically less capable than their, say, Eastern European peers AK line weapons are cheaper because governments are less able to restrict supply. Similarly, because governments in Eastern Europe are typically very stable, AK line rifles that were originally supplied to Cold War-era communist governments there tend to remain in government use. In Africa, this is less likely to be the case — frequent coups and government turnovers likely allow large number of government weapons to enter the private retail market, forcing down prices. This is part of why AKs likely sell for nearly twice as much in Syria than next door neighbor Lebanon — the Syria government has been fairly effective at controlling Syrian borders, suppressing private arms imports, while Lebanon’s often chaotic politics have allowed black market arms to enter and exit the country freely. 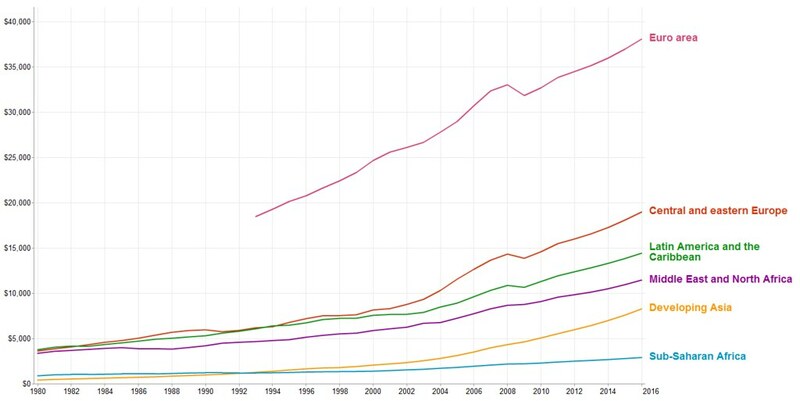 GDP per capita by region, 1980-2016 (US$). Source: International Monetary Fund, September 2011 World Economic Outlook. However, there is also reason to suspect that rising incomes could lower the local AK market price. In economist terms, AK line weapons are inferior goods — as buyers’ incomes rise, they are likely to trade up to a more expensive rifle. This theory makes theoretical sense: while the AK line’s legendary reliability makes it a superb infantry arm, its rugged construction and generous machining tolerances make it less accurate than other common assault rifles, like American M-16 and M-4 variants and the German G-3. This suggests that the small arms market will be less dominated by AK line rifles in regions with higher average incomes. Because income’s effect on AK market prices is predicted to work both ways, we can assume that income has an ambiguous influence on AK prices. However, because local GDP per capita generally matches up with observed AK market prices, it appears that market prices generally rise with income. Of course, because government capacity is strongly related to GDP per capita it’s likely that this observed price rise is due to a higher customer willingness to pay and restricted supply. Of course, we can expect the substitution effect away from AK line rifles to be more common in regions where competing assault and battle rifle designs are available. Soviet-designed weapons dominate the world small arms market. However, there are regions where competing non-Soviet rifle lines are more common, specifically Latin America and Asia. Let’s take a look at the weapons supplies of non-governmental armed groups in one of these regions, and see if this supports the substitution theory. Image by Scott Dalton/AP, via The Guardian. 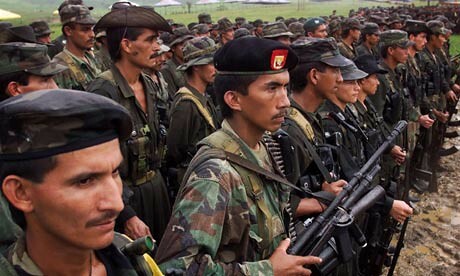 Most of the assault rifles carried by FARC fighters in this photo are AK variants. However, we can also see a German G-3 in the hands of one of the fighters in the first row. 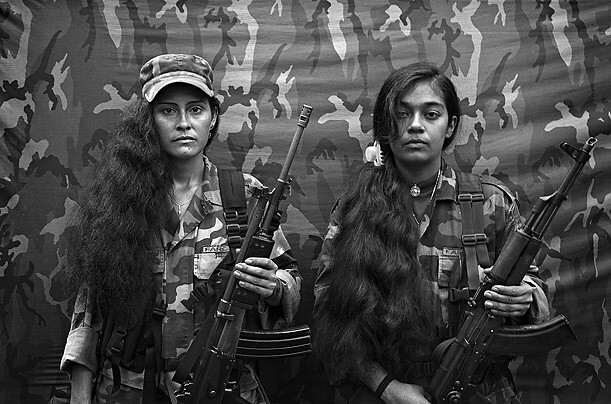 While the woman on the right is clearly armed with an AK variant, her companion on the left is holding what appears to be an Israeli-manufactured IMI Galil rifle. AK line rifles still dominate non-governmental small arms in Latin America, but they’re comparatively rarer than in regions where Soviet arms exports were more pervasive. Of course, non-Soviet arms are used in Africa and Asia — Taliban fighters are frequently found with antique knockoff rifles based on prewar British designs — but AK line weapons face more competition in Latin America. Possibly due to the substitution effect noted above, this depresses the local AK market price. But to really demonstrate a tendency to substitute away from AK line weapons, we need proof that AK competitors are seem as more desirable by fighters with access to them. Again, FARC weapon choices are a good example. 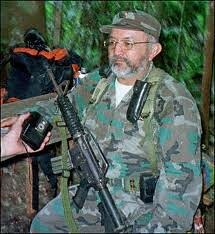 Here are two pictures of FARC leader Raúl Reyes, who was killed by the Colombian military in 2008. In the first picture Reyes is armed with an American M-16-based rifle, most likely a CAR-15 variant (based on the shape of the carrying handle and flash suppressor). The posing of the picture on the right makes the design of Reyes’ rifle less obvious, but it appears again to be a M-16-based weapon. The fact that a leader of a virulently anti-US group would choose to publicly adopt an American rifle design is strong evidence of a tendency to move away from AK line rifles when competitors are available. However, it’s worth noting that Reyes practice of carrying a weapon was almost purely symbolic — as a high-ranking commander, he almost certainly never expected to actually engage in direct combat. It’s possible that for fighters seeing frequent combat the reliability of the AK series would make it preferable. 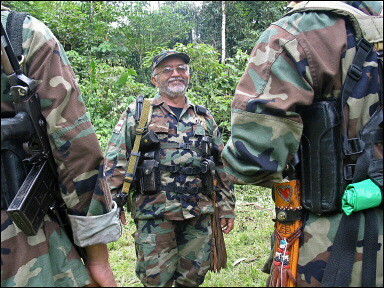 While the weapons choices of Reyes and FARC are anecdotal, they also mirror the weapons practices of a variety of non-governmental armed groups around the world. The supports the income substitution effect theory, and the idea that AK series rifles are an inferior good. Though the determinants of small arms prices are complex, these three inputs — availability, local demand and substitution effects — are a good start to understanding them.